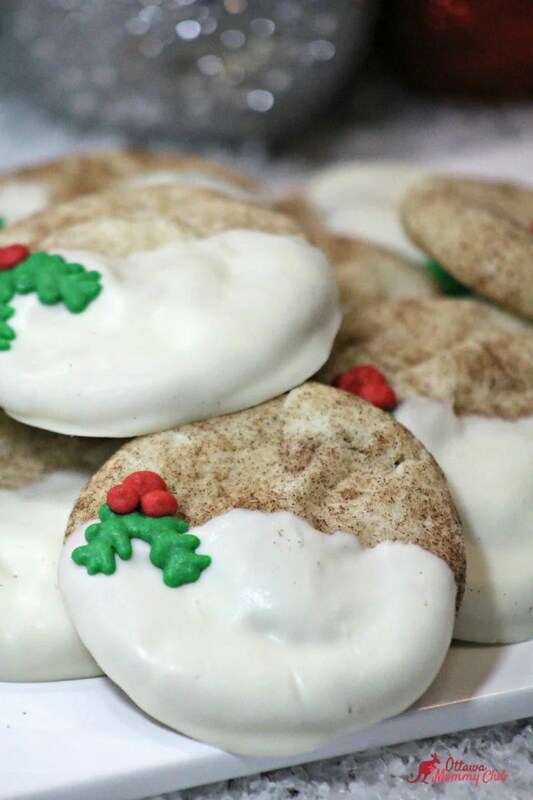 The perfect cookies to serve during the holidays! These are so delicious and the white chocolate icing makes it a sweet cookie everyone will love. Enjoy! -Combine the sugar, cinnamon, ginger, and all spice. -Cream the butter and the rest of the sugar mixture until it is light and fluffy. -Mix in the eggs and vanilla to the sugar mixture. -Sift the flour, cream of tartar, baking soda and salt in a separate bowl . -Add this dry mixture gradually to creamed sugar mixture and mix well. -Scoop the dough using a small ice cream scoop then; put these balls onto the lined cookie sheet. -Place the dough balls at least 2 in. apart on the cookie sheets. -Bake at 350′ degrees for 10-13 minutes or until edges begin to brown. -Allow for the cookies to slightly cool while still on the cookie sheet. -Move to a wire rack to cool completely. -Using a double boiler melt the white chocolate, stirring constantly. -Separate the egg yolk from the whites. putting only the egg whites into a mixing bowl. -Stir in the sugar, cream of tarter and vanilla to the egg whites. -Beating on medium for 6 minutes. -If the icing has the appearance of soup or is yellow in colour add more powder sugar, 1 cup. -Divide the icing equally into two bowls. -In the 1st bowl add some of the green gel food colouring, stirring to blend in the colour. -In the 2nd bowl add some of the red gel food colouring, blend in all of the food colouring. -Scoop all of the green and red icing in individual piping bags with #2 tips. -Dip half of each cookie into the melted white chocolate. -Allow to dry by laying the cookies on a cookie sheet lined with wax paper. -Using the green and red icing add the holly and berries to each cookie. -Begin by using the green icing to make the holly, refer to the picture of the cookies for further examples. -Allow the holly to dry for 30 seconds before making three small red dots with the red icing. -Allow for this to dry completely. Combine the sugar, cinnamon, ginger, and all spice. Cream the butter and the rest of the sugar mixture until it is light and fluffy. Mix in the eggs and vanilla to the sugar mixture. Sift the flour, cream of tartar, baking soda and salt in a separate bowl . Add this dry mixture gradually to creamed sugar mixture and mix well. Scoop the dough using a small ice cream scoop then; put these balls onto the lined cookie sheet. Place the dough balls at least 2 in. apart on the cookie sheets. Bake at 350′ degrees for 10-13 minutes or until edges begin to brown. Allow for the cookies to slightly cool while still on the cookie sheet. Using a double boiler melt the white chocolate, stirring constantly. Separate the egg yolk from the whites. putting only the egg whites into a mixing bowl. Stir in the sugar, cream of tarter and vanilla to the egg whites. Beating on medium for 6 minutes. If the icing has the appearance of soup or is yellow in colour add more powder sugar, 1 cup. Divide the icing equally into two bowls. In the 1st bowl add some of the green gel food colouring, stirring to blend in the colour. In the 2nd bowl add some of the red gel food colouring, blend in all of the food colouring. Scoop all of the green and red icing in individual piping bags with #2 tips. Dip half of each cookie into the melted white chocolate. Allow to dry by laying the cookies on a cookie sheet lined with wax paper. Using the green and red icing add the holly and berries to each cookie. Begin by using the green icing to make the holly, refer to the picture of the cookies for further examples. Allow the holly to dry for 30 seconds before making three small red dots with the red icing. Allow for this to dry completely. OOh I love chai! I never would have thought about adding it to cookies!! Thanks! I shall have to try this! These look so pretty and they sounds really good too. I pinned! So where does the name Chai Snickerdoodle come from? 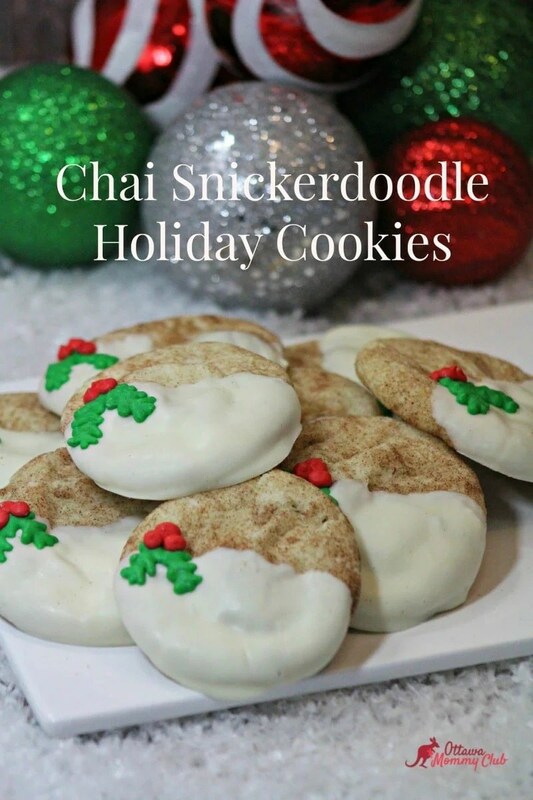 I only know chai as tea and presume snickerdoodle is just another word for cookie? 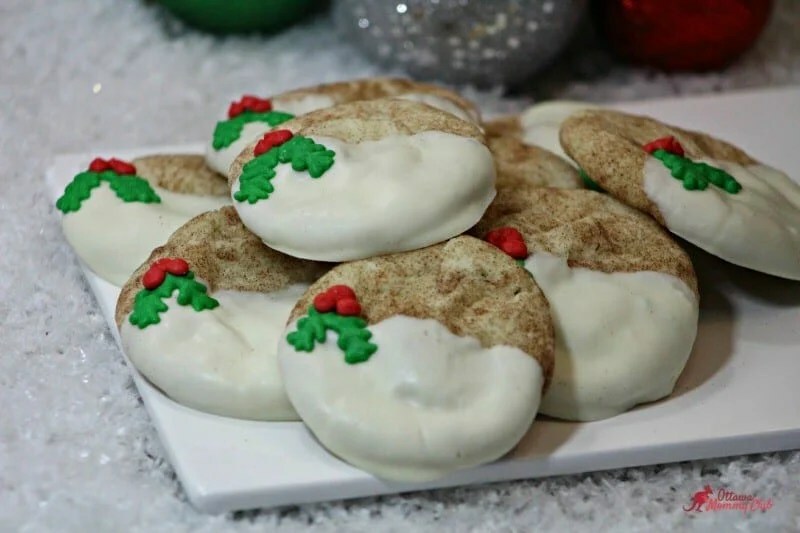 The spices in the cookie make the Chai and Snickerdoodle are often referred to as “sugar cookies” and they are usually rolled in a mixture of white sugar and cinnamon. I love Chai lattes, and these cookies remind me of little delicious versions of my favorite drink – yum! Thank you for the holiday inspiration. I have soooo many cookie recipes saved, but I may have to bump this to the top of the list- thanks! Thanks for the recipe,we made these yesterday for the very first but never put the icing on.They are delicious with a cup for hot tea. They are good with or without the icing! Nicely done. I’ll try making some, but probably leave out the beautifully decorated creativity part. These look so good! And so festive! These would look so pretty on my holiday treat platter. These sounds really good. Love how you dipped them in white chocolate and added the little sugar decorations – so festive! I think I’ll make these for my holiday buffet. They look so festive! These sound like they would be yummy. I love the decorations on them. Thanks for the recipe I will make these this week-end with my daughter, one of her favorite cookies. These sound really good and perfect for the season!! Snickerdoodles are so delicious but you’ve made them pretty too. I love them ! I can’t wait to try this recipe. They are perfect for the Holidays.